The art is by Javier Garron. Medusa and the others find a way to escape their prison. 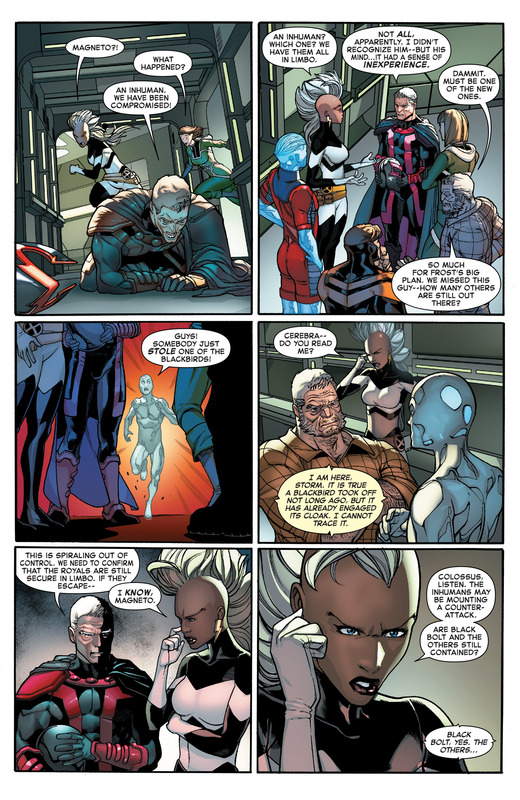 Storm tells Colossus to hold them off. Well, let's see... the X-Men are a group of multi-racial, multi-ethnic superheroes with a history of fighting racism and general oppression. 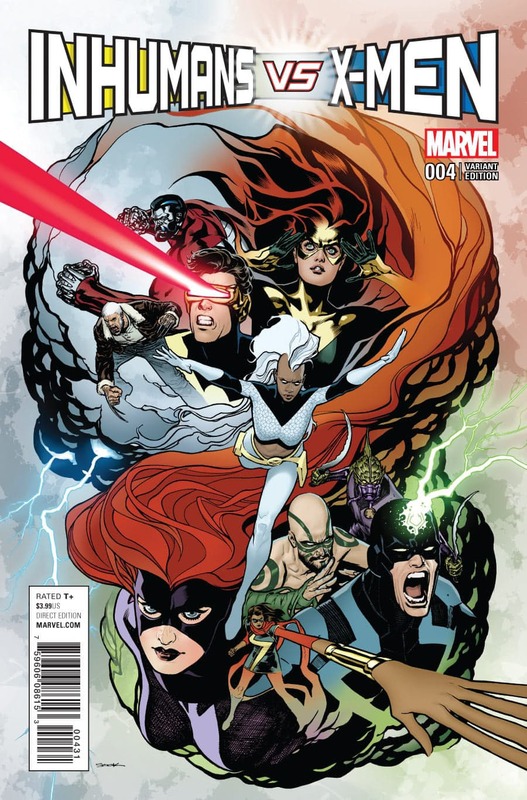 And Kamala's on the side led by people called "Medusa", "Gorgon", "Black Bolt". Do those really, really sound like the names of good guys? I mean, Black Bolt sounds like the name of a space pirate. This is literally the first time that I noticed that the Inhuman royal family has both a "Medusa" and a "Gorgon." Even though they look nothing alike and have completely different power sets. And Gorgon is a dude. Read some mythology before you pick your names, guys! Well, that's not like "Cyclops", "Beast", "Colossus" or "Storm" are any better. The good guys aren't the ones complicit in genocide. 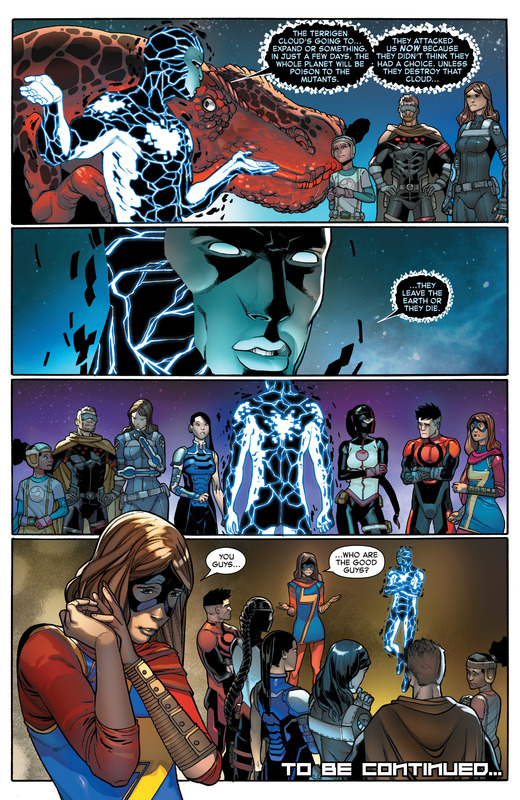 Why did Black Bolt decide to Kill All Mutants? He didn't, he's just cool with it being a side effect if it means more Inhumans. Yea, it's just, "Oh, the thing we caused may cause lots of death? Oops, too bad. Whelp, it's still important to us and it doesn't kill anyone of *us*, so we better protect it!" Hm, I can think of some companies that think that way. The X-men's home is in a demonic hell dimension, and they only moved there because they don't want to die choking on Inhuman poison. 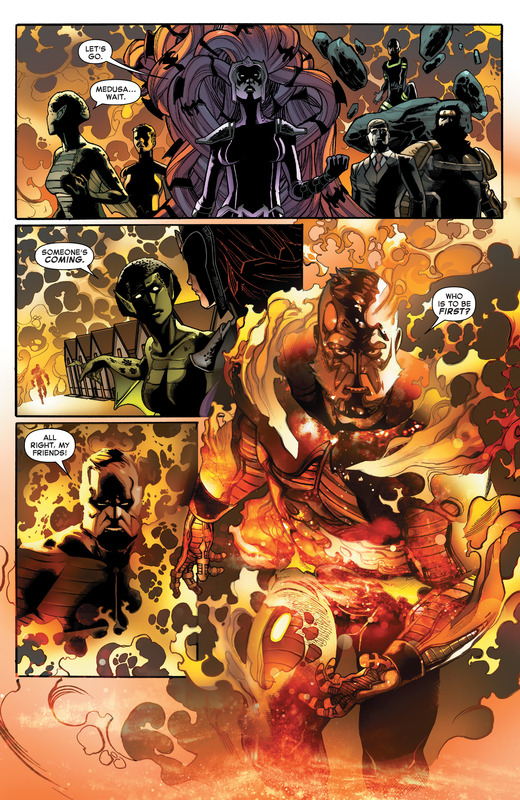 And now the Inhumans are setting that place on fire. 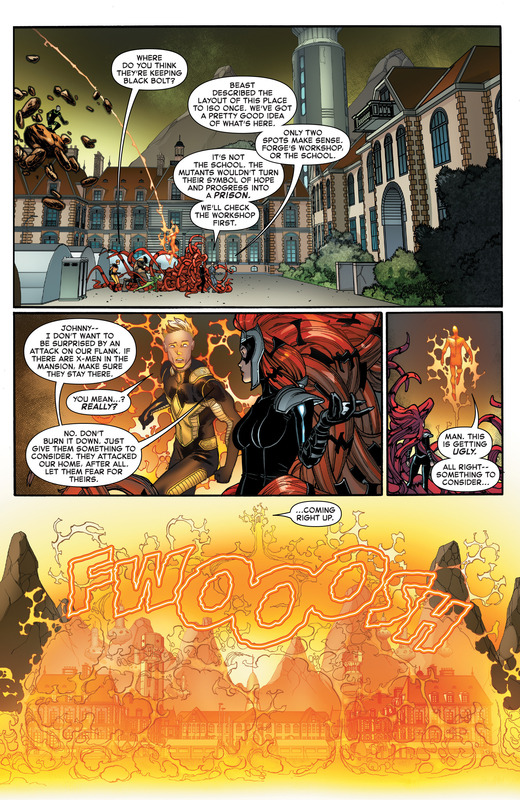 Earth-616 was already a demonic hell dimension if you're a mutant. Oh Ms. Marvel, you keep ending up getting pulled into stupid crap. I recommend whenever a group of "heroes" want you to help them fight other heroes, you just back awayard and run. Isn't that basically what happened in 'Champions'? "Well, sure, they needed to survive, *but* they put the Inhumans in limbo so they could save themselves! Surely these things are equivalent?". Okay, that Colossus spot was as badass as it can get. I also like that they are finally acknowleding that he is one of the more powerful mutants around. I mean, he's a strong brick, but the X-men have so many planetary-level (or higher!) threats he's kind of down there. I'd say he's in the category I'd call 'strong,' but below the really uber Omega etc. mutants. He's strong, but in the subcategory of "will be beaten up to show the situation's got serious". Yeah he's the X-Men's Worf , ST:TNG version before going to DS9. Which is why when they actually let him be the badass he is, it's always a beautiful moment. Yeah, I'm reminded of the time he fights Excalibur (after beating up Pete Wisdom for daring to sleep with his ex-crush from 20 years previously) and it's pointed out that he's not even the strongest person on THAT team, both Captain Britain and Meggan are physically stronger. But that's just it, he shouldn't be. He is one of the physically strongest beings in MU, they just keep downplaying that for the Worf effect. Hence my joy on this scene seeming to embrace that. He was introduced as Class 40 or so as a youngish X-man, but he's now normally in the Class 70 to 100 range. That's not an uncommon strength level amongst superbeings. he was a match for the Thing in Annual #5, before his Mutant Massacre Magneto rebuild power-up. The first I saw in OHOTMU had him at Class 70, and he's grown a lot since then. Didnt some of the Nuhumans have their families wiped out because they had insufficient Inhuman genes to survive Terrigenesis? How do they feel about having the entire world get the cloud? I'm very glad they didn't drag out Kamala and the others being in the dark on why the X-Men were fighting so hard.